Cook up this hardy soup to feed the hungriest tummys. Kids of all ages love it. 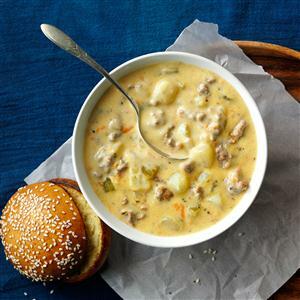 Dovetailing Tip: Pull out the ground beef that you cooked yesterday and add to the Cheeseburger Soup. In a large saucepan over medium heat, cook and crumble beef until no longer pink; drain and set aside. In same saucepan, melt 1 tablespoon butter over medium heat. Saute onion, carrots, celery, basil and parsley until tender, about 10 minutes. Add potatoes, beef and broth; bring to a boil. Reduce heat; simmer, covered, until potatoes are tender, 10-12 minutes. Meanwhile, in a small skillet, melt remaining butter. Add flour; cook and stir until bubbly, 3-5 minutes. Add to soup; bring to a boil. Cook and stir 2 minutes. Reduce heat to low. Stir in cheese, milk, salt and pepper; cook until cheese melts. Remove from heat; blend in sour cream. Yield: 8 servings (2-1/4 quarts).